We have plenty of items here at Calendar Lady Promotions for the sweet tooth and an excellent little item is our Company Mint Cards. Our Company Mint Cards are 50 sugar free mints in a high quality plastic credit card dispenser with easy opening mechanism. Available in 3 great colours. 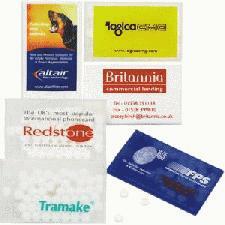 Other promotional and personalised items besides our Company Mint Cards click here. To find out more about our Company Mint Cards click here and fill in the contact form and we'll get straight back to you.